Nickelback bassist Mike Kroeger has spoken about his love of metal in a new interview and says that it’s his wish for the band to record an album of Slayer covers. 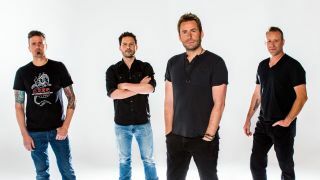 He was speaking with Australian website Wall Of Sound when he said that he, vocalist Chad Kroeger, guitarist Ryan Peake and drummer Daniel Adair were “metalheads” and also revealed that a metal album from Nickelback is something that they’d love to do. Asked if the band would consider delving into a heavier sound on future albums, Mike responds: “I would love to. Metal is what makes me go – it’s what I listen to without fail. “If we could actually sink in and do a metal album, all four of us would love it. I know that we’re all – on differing scales – metalheads at our core. He adds: “I listen to bands like Meshuggah, Gojira, Lamb Of God… and we became friends with those guys. Daniel and I nerd out on stuff they do, and as musicians we love to listen to it. Have you ever listened to Animals As Leaders? Nickelback will play three shows in Japan later this week, before heading to Australia for further dates in support of their 2017 album Feed The Machine.